The Industrial History of the Ipswich River was produced for the Ipswich 375th Anniversary by John Stump, volunteer for the Ipswich Museum, and Alan Pearsall, who produced the Ipswich Mural with funding from EBSCO. Historic photos are by Ipswich photographer George Dexter. This page was created by Ipswich town historian Gordon Harris. In February of 1824, permission was given to build a dam here in order to provide water power for a mill, but it was not built until 1829. This dam was said to be about 6’ tall in a 1918 report and is still standing today. 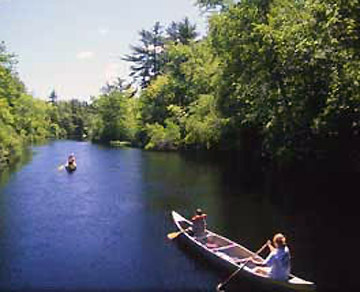 Foote Brothers Canoe Rentals was established here in 1955 and is still in operation today with second and third generation family members operating the business.The first mill built here was a Sawmill in 1829. In 1834 it was converted into a Textile Mill. It produced hosiery as well as woolen goods and was in operation until a fire in January of 1884 destroyed it. The foundation can still be seen today. A long sluiceway was built here and runs parallel with the river, directing the water flow under the mill. In February of 1824, permission was given to build a bridge here. It was not built until 1844-5 and is still in use today. A dam is known to have been at this location as early as October of 1923, and is used to monitor the water flow of the river. There are no records on the remnants of the dam located about a half mile downstream from here, but it is thought to have been built to slow the river’s flow and create a “pond” to draw water from for irrigation purposes. 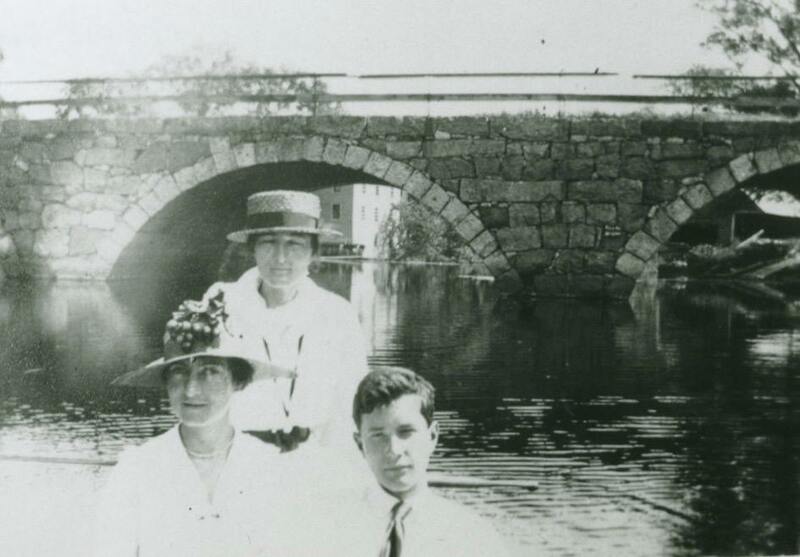 Violet Thayer and family members upstream from the Mill Road bridge in 1916. Photo courtesy David Thayer. 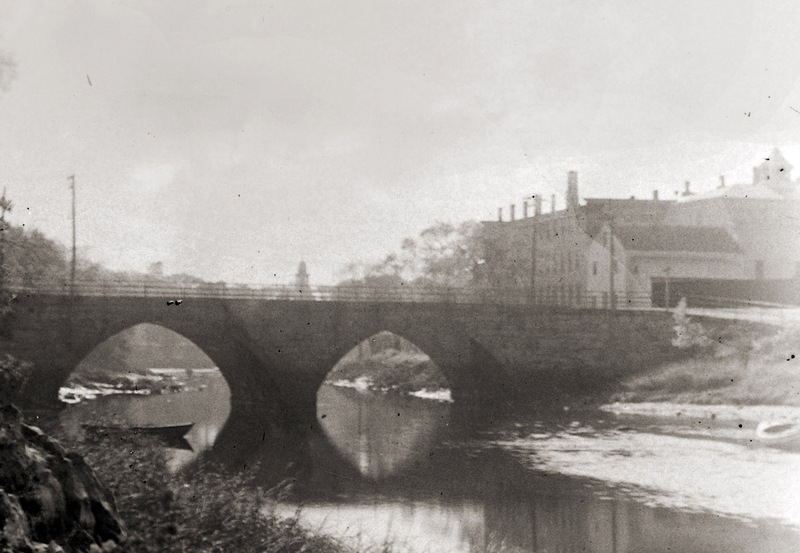 Just upstream from the Mill Road/Highland St. bridge, an earlier bridge was built about 1667, but no longer exists. The current bridge was built between 1829 and 1832, with three stone arches. The bridge was severely damaged and closed after the Mothers Day Flood of 2006, and re-opened May of 2009. This site was first in use in 1697 as a fulling mill. In 1794. a carding machine and a picking machine were added. Sometime around 1857 it was converted to an Isinglass Mill. This mill was in use until approximately 1912. In the late 1880’s, it was producing 100,000 pounds of isinglass annually. The building was torn down in 1919, but portions of the foundation and sluiceway can still be seen today. On the Hamilton side of the bridge, a grist mill was built at this location in 1697 and continued in operation until 1918. 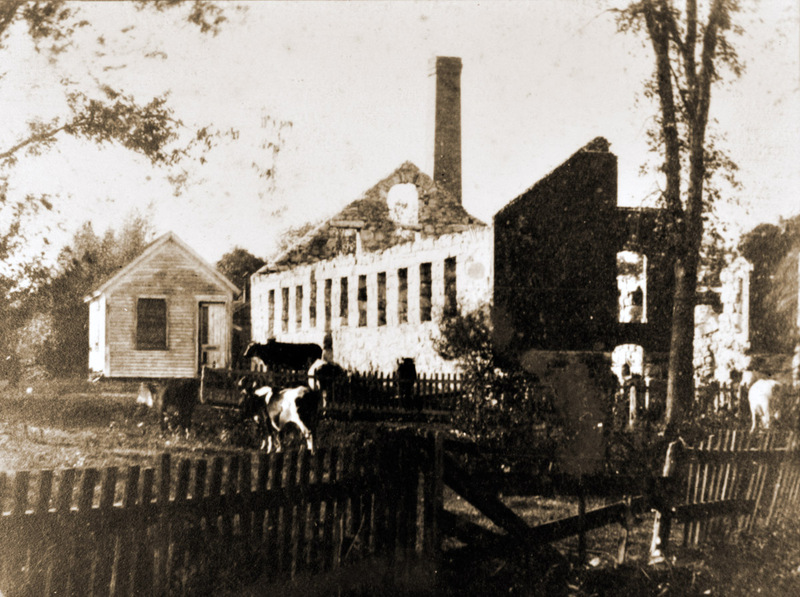 A saw mill was added circa 1750, and was also in operation as of 1918. By 1880, a cider mill had been added and was in operation until 1919, when the property was sold. During the year 1887, the cider mill consumed more than 10,000 bushels of apples, resulting in the production of 35,000 gallons of cider, and in 1918 the mill produced 60,000 gallons. After a fire in 1822, a new structure was built to house the grist and cider mill that is still standing today. From the bridge, you can see the remnants of the dam. The original dam at this location was built in 1697 in conjunction with the building of the fulling and grist mill. It was allowed to be built 3′ above the river’s normal level. It can be assumed that it was torn down when the mills no longer operated at this location. Goodhue’s pier, early 20th Century. Photo courtesy of Bill George. A railroad bridge has been in continuous use about a half mile upstream from the Ipswich Mills, since 1839. The original granite abutments are visible. An ice house was built about 1890 on the river off of Haywood St, and is thought to have burned in the 1940’s. Ice was harvested from the river and stored here for use throughout the year. In 1938 the ice being harvested from the river was 14″ thick. If the river did not freeze enough, ice was brought down in boxcars by rail from the north. Down river off of Peatfield St. just above the dam was where Goodhue’s Boathouse was located. 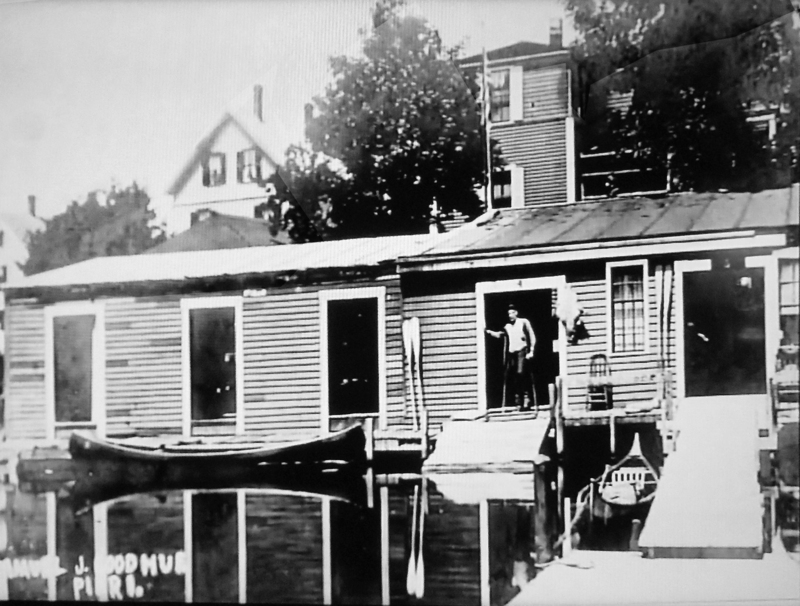 It was in business as early as 1891, and rented boats for recreation as well as offering accommodations. The location is a public canoe launch today. This location was home to early industries. A sawmill was in operation here in 1729 and is believed to have operated until 1858. The first dam at this location was probably built in 1635. It was most likely maintained by each subsequent mill owner. A new dam was built in 1827. The height of the dam, as with the others along the river could be adjusted with the use of flash boards. 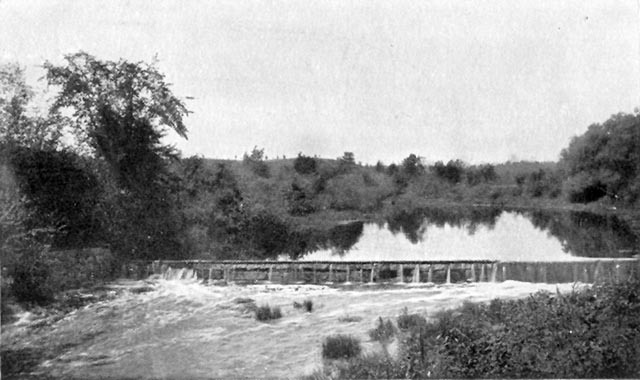 The dam still stands today at the site of EBSCO Publishing. The name “Mill Garden” was given to this location due to the numerous types of mills that were located here throughout the years. There were at different times, grist mills, fulling mills, dye houses, saw mills and hemp mills. This was the site of the first grist mill built in Ipswich in the year 1635. This site was also the location of the first water-powered cotton mill in Ipswich in 1828. A textile mill operated in different forms here until 1928 and was one of Ipswich’s largest employers. 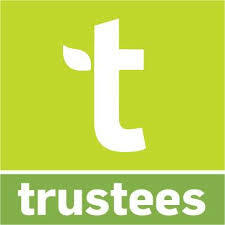 It then became the location of Sylvania and today is the home of EBSCO Publishing. Choate Bridge. Photo by George Dexter circa 1900. As early as 1635 there is mention of a footbridge for pedestrians here. By 1646,a bridge had been built, large enough to allow animals pulling carriages or work carts to cross. 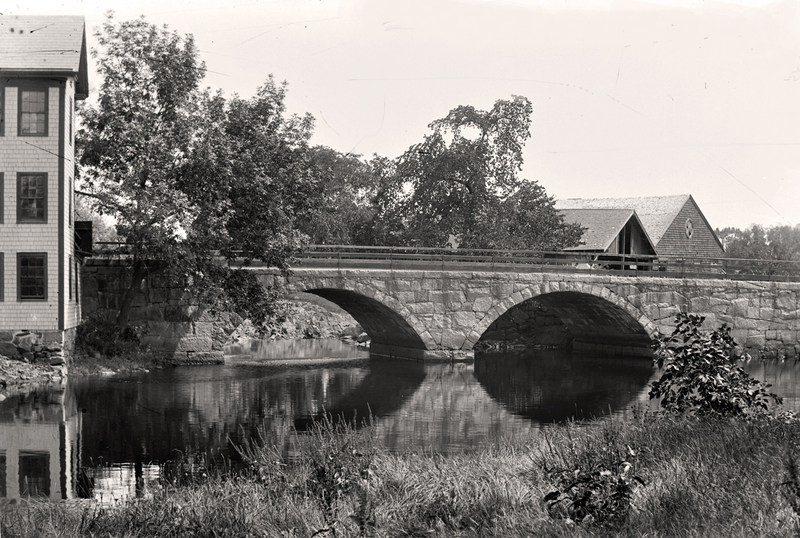 In 1764 the double stone arch Choate Bridge that is still in use today was built. 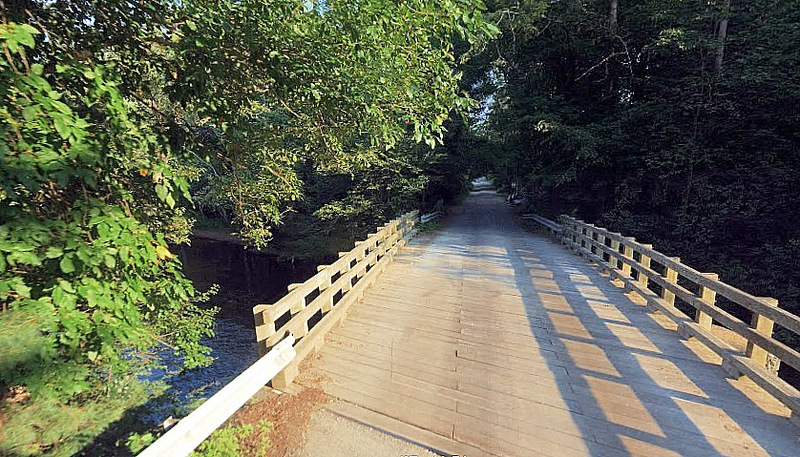 It is believed to be the second oldest stone arch bridge in America. In 1794, next to the bridge at the site of the Caldwell Building, a horizontal windmill was built by Dr. John Manning to be used in the production of woolen textiles. It was a complete failure. In 1673, a fulling mill was built here and a grist mill in 1715. It is believed a grist mill was in operation here until at least 1872. As early as the 1720’s this location was used as a wharf, and soon thereafter a shipyard was established. The town voted on March 11, 1861 to build this bridge due to the roundabout way people were forced to travel with the many heavy loads heading to and from the wharves along the river. Prior to the dam being built water power for the early mills here was generated largely due to the Falls, There is still remnants of a dam here today. In 1863, a mill was built at this location to produce yarn, and within 5 years it was producing hosiery. The mill complex was eventually used as a box factory and a warehouse before being torn down about 1920. During the 1870’s Ipswich was receiving shiploads of corn, carrying as much as 3,000 to 5,000 bushels at a time. For many years a sawmill was in operation here. The first one is believed to have been in use by 1652, and the last standing sawmill here was in 1902, although not in use at the time. 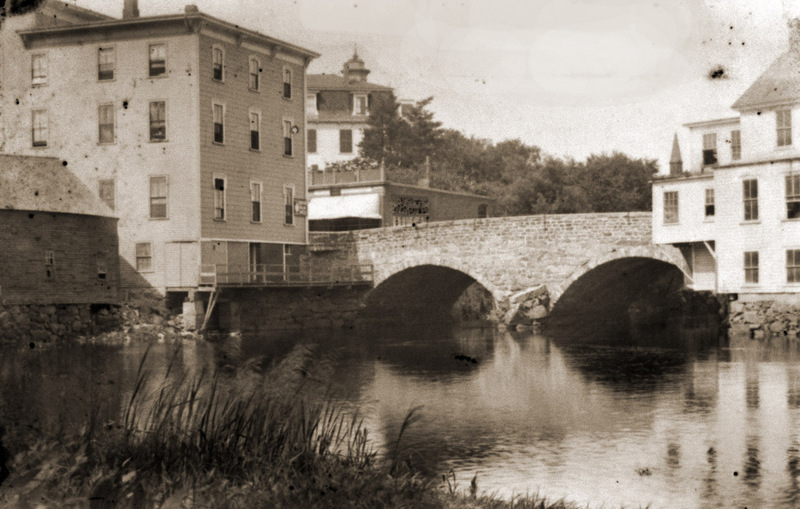 Mid-19th Century photo taken from the far side of Great Cove by George Dexter of the new County St. bridge. The sawmill dam can be seen on the left, and the Congregational and Methodist churches are in the distance. A Distillery for the manufacture of rum was located along Turkey Shore as early as 1765. It continued its operation until 1836, when it was sold and converted into a Tannery, which was still in operation in 1872. The riverbank that now hosts the Sidney Shurcliff Riverwalk was used as a campsite by Native American’s to fish during the spring spawning. 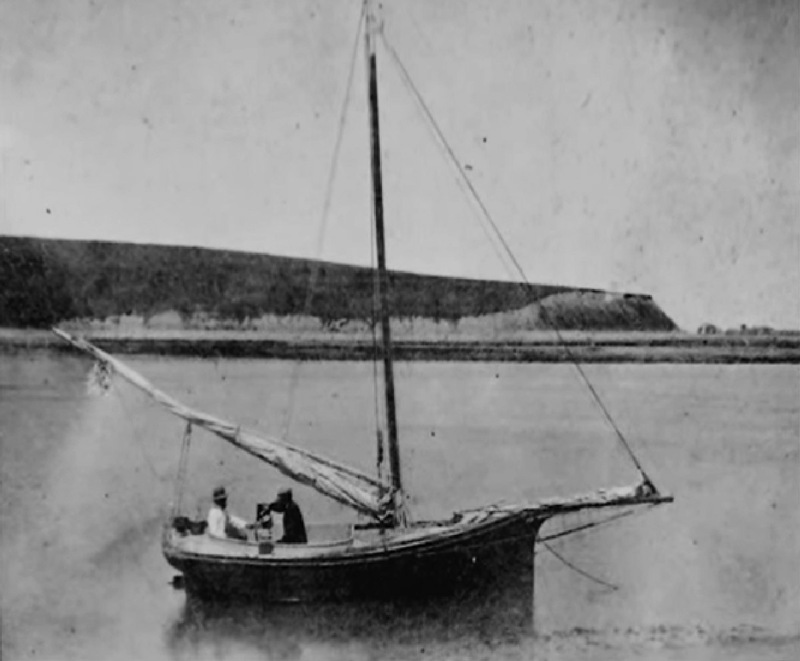 Two and three-masted sailing ships loaded and unloaded wares in the Great Cove, timing their arrival and departures with the tide. 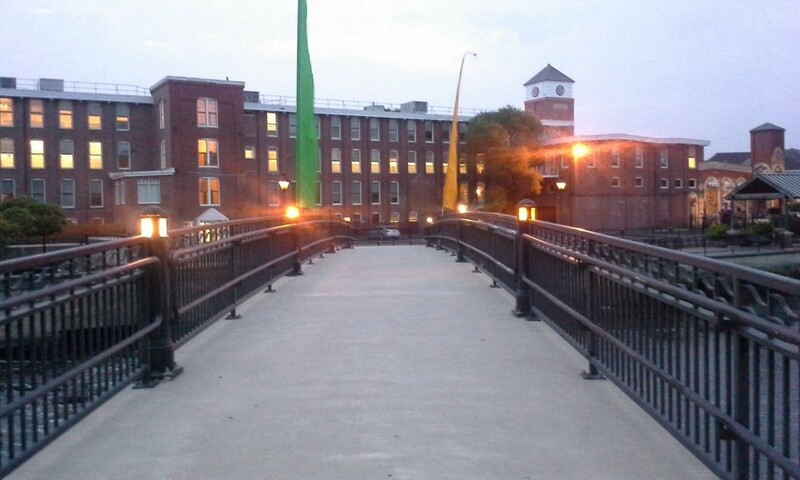 The Green St. bridge and the Ipswich jail . Photo by George Dexter, 19th Century. A Jail Complex was built at the site of the current Ipswich Town Hall in 1806. It was also home to an Insane Asylum and a Prison Shoe Workshop.This bridge was built in 1881-82 with stone piers and a wooden roadway. It was rebuilt in 1894 with stone arches, and is still in use today. An Ipswich bridge contractor named Joseph Ross who patented a horizontal folding bridge for railroads in 1849 was the builder.The remnants of a dam that was built in the 1930’s as a Works Project Administration (WPA) project can still be seen just above the bridge. A shipyard was in operation here in 1673, and it was also the location of a tannery as early as 164, thought to have continued until the 1690’s. In 1652, this location was being used for the manufacture of salt from seawater. This was also one of 3 locations along the river where the Choate Family operated a shipyard. A wharf was built in this area in 1756 and was often used for unloading molasses from the West Indies for use in the distillery. John S. Glover operated a coal wharf at this location. 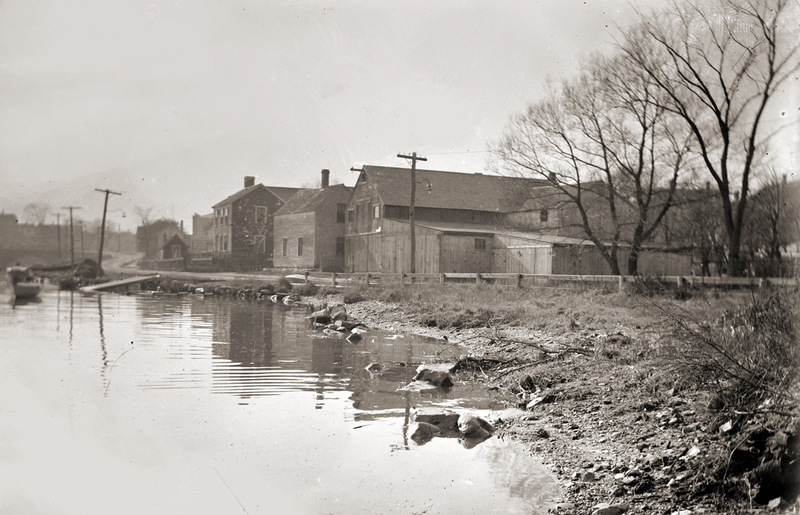 View of the area that is now the Town Wharf, as seen from Heard’s Wharf at the end of Agawam Ave. Photo by George Dexter, before the 20th Century. As early as 1641, this area was built up with wharves for shipping. Some of the many items shipped were lumber, lime, sand, coal and granite. Over time there were many individuals involved in the shipping industry here. A continuous wharf wall was built in 1865. In 1663. a brewery and warehouse were built here. The large boulder in the river across from the wharf is known as Ring Bolt Rock. It was used by ships to navigate the turn in the narrow channel. At the end of Agawam Avenue was another shipyard operated by the Choate Family. There was a wharf on the other side of the river in 1692, Early settler Daniel Hovey built a wharf along the river below Tansey Lane. 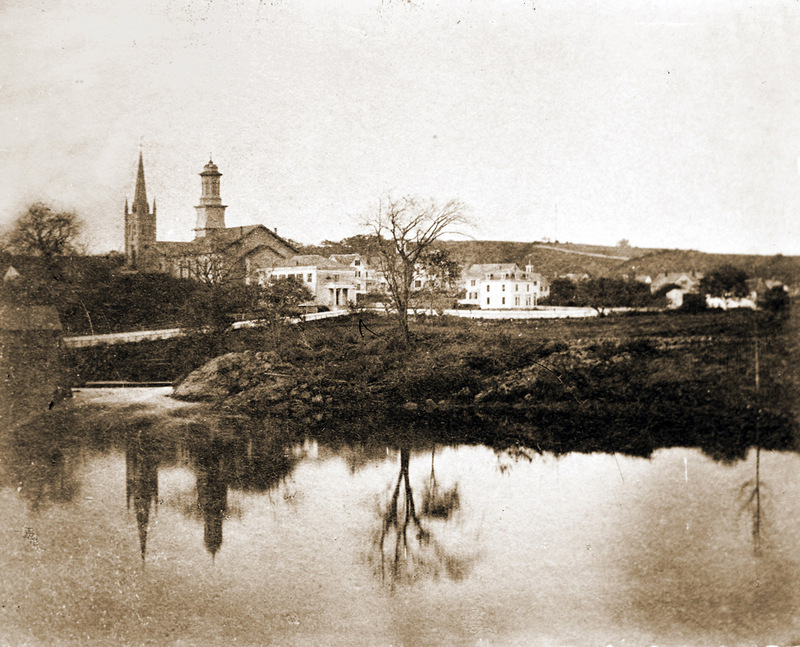 This photo of Little Neck is believed to have been taken in 1864. Photographer unknown. As early as 1635 there were fish-drying stages located on a small river island off of Greenwood Farm. The Fox Creek Canal connects the river and Essex Bay, and is the oldest man-made tidewater canal in the United States. The mouth of Fox Creek was the site of Robinson’s Shipyard, which employed hundreds of people during World War II. 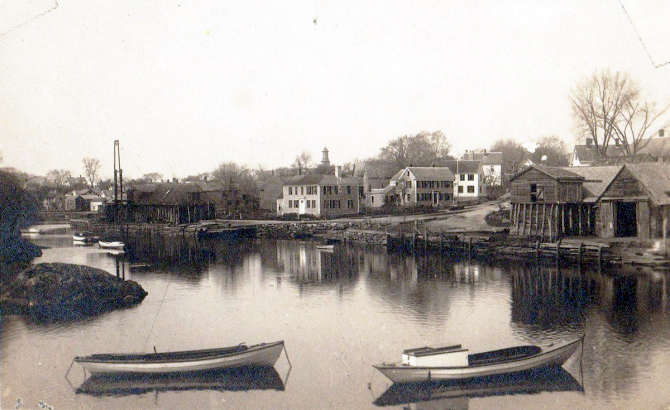 Little Neck was the location of numerous fish drying stages and warehouses as early as the 1640’s.